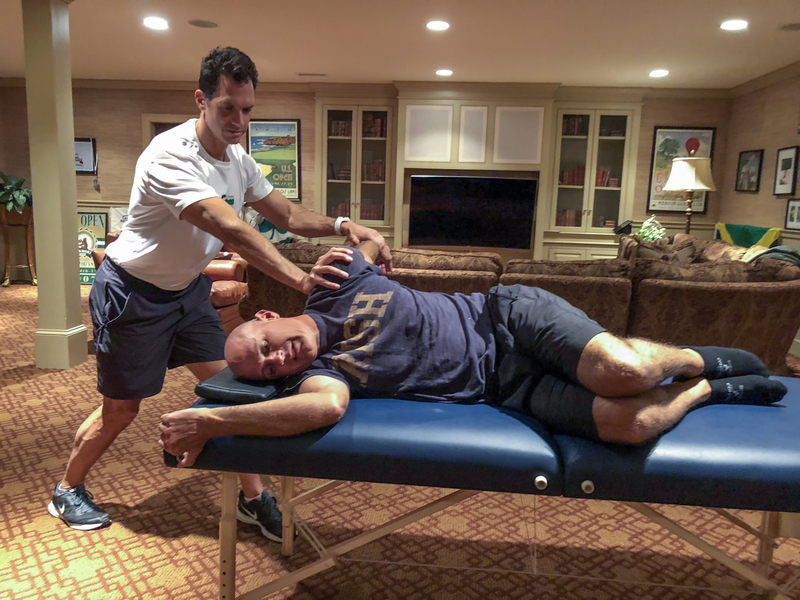 AIS is a method of muscle lengthening and fascial release that provides effective, facilitated stretching for musculature within the human body. Creator Aaron Mattes integrates both anatomy and physiology to promote restoration of muscles, tendons, joints and ligaments establishing healthier superﬁcial and deep fascial planes. The name of the game is to stabilize and isolate. The Mattes Method is a manual technique that isolates muscles that are to be stretched by contracting the opposing muscles. This manner of stretching is inner structure work and results are based on delicacy and precision. Each stretch is performed in a functional range of motion (R.O.M.) avoiding compensation from neighboring muscle groups. Rhythmic breathing is essential. Exhalation at the beginning of the stretch allows muscles to relax decreasing muscular fatigue. This breathing pattern should be consistent throughout the entirety of the session. The basic scientiﬁc principle of AIS is in the neuromuscular communication within our body. As the subject actively contracts a muscle on one side of a joint, the muscle on the opposite side sends a neurological signal to relax or release. This is known as reciprocal inhibition. This process allows for muscles on both sides of the joint to work in synchrony producing a smooth movement or stretch. It is in this phase that myofascial tissue is safely prepared to be dramatically lengthened as optimal ﬂexibility is achieved. Repetitions are repeated accordingly, gradually warming the tissue increasing elasticity and R.O.M. Each stretch is held for a short 2.0 seconds to prevent activation of the protective stretch reﬂex which would ultimately neutralize the targeted stretch. Furthermore, the neuromuscular nature of this technique is deeply proﬁtable for those suffering with nervous system disorders. Active isolated stretching has transcended the conventional static stretching that is persistently the default method for muscle and tissue lengthening. Prolonged static stretching actually decreases blood ﬂow to tissues creating lactic acid build up within the muscle. This can potentially cause injury to local muscles and tendons as well as trauma to neural tissues. The Mattes Method is an efﬁcient method of restoring systemic functional balance that deﬁnes and embraces general wellness. This intricately detailed yet practical brand of stretching delivers healing, longevity and enrichment to the quality of life. Stretching with gentle precision and regularity will steadily awaken the muscles that make us “go” optimizing our physical existence. Increase and maintain complete range of motion (ROM) of the joint. Relieve muscle soreness. Facilitates increased blood volume to the muscles increasing body temperature to reduce muscular tension. Help improve our capacity for physical activity and longevity. Stretched muscles require less energy for completion of movements allowing for increased stamina and performance enhancement of speed, strength and agility. Relieve muscle-joint stiffness associated with overuse, trauma and the aging process. Optimal ﬂexibility can reduce postural tightness created by restricted myofascial structures that support the spine. Elongate the fascia (connective tissue). Fascia is a web of ﬁbrous tissue that is continuous throughout the body. It surrounds muscles, bones and joints, which gives our body structural integrity and strength. Fascia also permeates our nerves, blood vessels and organs. Increase muscle and tendon extensibility. Muscles can be stretched 1.6 times its resting length before it tears. Facilitates the removal of metabolic waste products. Improved oxygenation eliminates carbon dioxide and improved circulation removes lactic acid build up. Assists in decreasing neuromuscular tension, promoting general body relaxation and reducing emotional stress. Rehabilitates muscle, tendon, joint and ligament injuries. Helps prevent joint sprains and muscle strains including re-injury to previous joint and muscle trauma. Flexibility promotes improved blood circulation and oxygenation, nourishing cells, tissues and organs restoring health and wellness. Facilitates the ﬂow of lymphatic ﬂuid that allows the body to release blockages and channel toxic products out of the body. Reduces rigidity that may contribute to pain, spasm or cramping.